Strong science, technology, engineering and maths abilities are becoming core skills in trade and technical jobs. 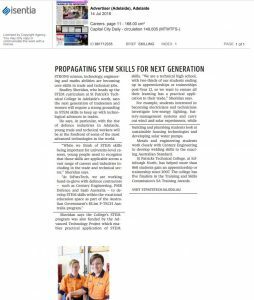 Bradley Sheridan, who heads up the STEM curriculum at St Patrick’s Technical College in Adelaide’s north, says the next generation of tradesmen and women will require a strong grounding in STEM skills to keep up with technological advances in trades. He says, in particular, with the rise of defence industries in Adelaide, young trade and technical workers will be at the forefront of some of the most advanced technologies in the world. “While we think of STEM skills being important for university-level careers, young people need to recognise that those skills are applicable across a vast range of careers and industries including in the trade and technical sector,” Sheridan says. Sheridan says the College’s STEM program was also funded by the Advanced Technology Project which enables practical application of STEM skills. 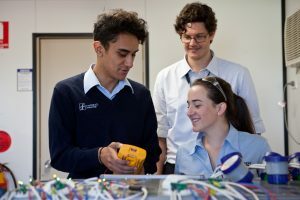 “We are a technical high school, with two-thirds of our students ending up in apprenticeships or traineeships post-Year 12, so we want to ensure all their learning has a practical application to their trade,” Sheridan says. For example, students interested in becoming electricians and technicians investigate low-energy lighting, battery-management systems and carry out wind and solar experiments, while building and plumbing students look at sustainable housing technologies and developing solar water pumps. Metals and engineering students work closely with Century Engineering to develop welding skills to the exacting Australian Standard. St Patricks Technical College, at Edinburgh North, has helped more than 860 students gain an apprenticeship or traineeship since 2007. The college has five finalists in the Training and Skills Commission’s SA Training Awards.